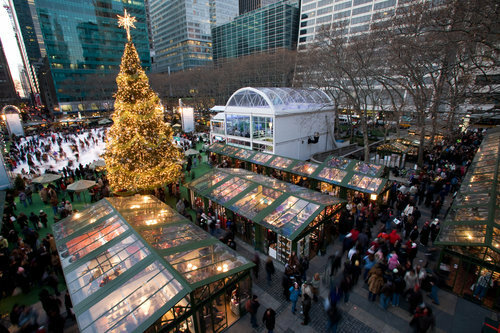 The Holiday Shops at Bryant Park opened last Friday, November 6, for their longest season yet. Visitors can browse and buy for a full 59 days this year (compared to 37 days in 2008), through January 3, 2010. A combination of holiday gift items and “any time” items are available from 127 distinct and diverse vendors. Sample Carter & Cavero’s selection of artisanal olive oils and balsamic vinegars, pick up treats and accessories for your favorite pooch at Annie’s Dog Bakery & Boutique, try on Wendy Culpepper’s handcrafted designer jewelry, or choose a one of a kind print for your wall at Studio Manhattan Fine Art. This year you can find information on all vendors through The Holiday Shops interactive map, searchable by product category or vendor name. We’re pleased to report that the market has already garnered quite a bit of attention from blogs and publications. Check out the coverage on Racked.com, The Thread blog at nbcnewyork.com, Time Out New York Kids, and every Midtown worker’s go-to lunch guide, MidtownLunch.com. Don’t forget to visit The Shops’ website at theholidayshopsatbryantpark.com, and follow them on Twitter @BPHolidayShops for real-time information and exclusive promotions.